This turn of the century box is a beautiful example of decorative art from the British Arts & Crafts movement. The Arts & Crafts movement was inspired largely by the writings of John Ruskin and the ethos of the artist William Morris. The British Arts & Crafts movement encompassed a wide range of social and artistic beliefs. Its supporters believed that art should be available to everyone of every walk of life. As William Morris said, “…I do not want art for a few; any more than education for a few; or freedom for a few…” The movement began as a reaction against machine production, and searched for a new aesthetic design that embraced simplicity and high quality materials. Charles Robert Ashbee (1863-1942) was a primary figure in the entrepreneurial side of the Arts & Crafts movement. He founded the Guild of Handicraft in the 1890s which employed numerous craftsman and artisans to create jewelry, enamels, furniture, and ironwork, as well as other pieces of “handicraft”. Charles Fleetwood Varley joined the Guild of Handicraft in the 1890s and quickly gained fame specifically for his sophisticated creations in enamel. When the Guild dissolved in 1907, Varley found success in marketing his richly detailed enamels at the noted retailer Liberty & Co, where they became much sought after. This box is a striking example of Varley’s painterly approach to enamelwork. 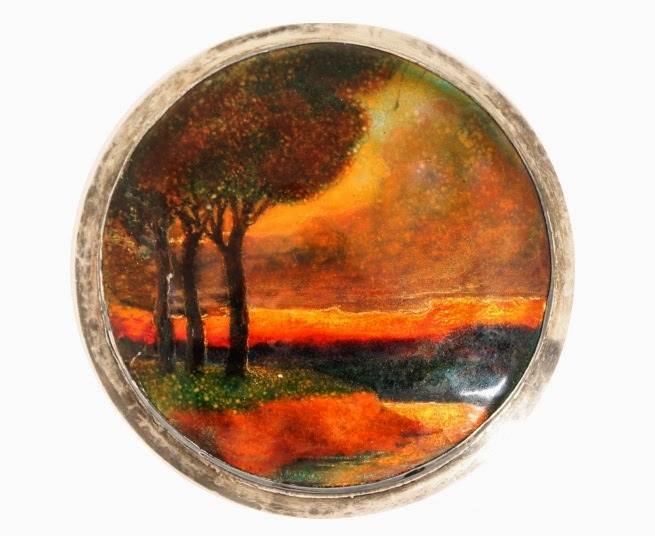 The round panel depicts a peaceful, lightly wooded landscape at sunset. The vibrant autumnal colors are used to a particularly evocative effect. The round box itself is crafted in hand hammered sterling silver, date marked for 1903, placing it within Varley’s time with the Guild of Handicraft. The box is signed in the enamel by Varley, as pictured. Learn more about this amazing Guild of Handicraft enameled silver box here. Find other antique enamel and sterling silver works of art in our store.